I am a football fan since years, meaning a soccer fan, and I have to admit it’s hard for me to understand all the rules of the American Football Game. The incredible game and show that is taking place this Sunday, almost stopping the everyday life is really amazing and fascinating. So I watch and eat, like millions others, not only the crazy so funny ads but the all thing. A lot of parties and get together happening this coming Sunday afternoon, here is a Mexican flavors party favorite ,this is creamy and spicy, melting in your mouth, easy to share in small slices, well not really..it is too good..
Let’s go and play with great ingredients! 1/2 cup chicken broth or half cube dissolved in warm water. Sprinkle well chicken breasts with dried oregano and turn to coat. In a plastic bag, combine chicken breast and dry white wine . Close and place it on a shallow bowl into the refrigerator,let it stand for at least 1/2 an hour. By marinating the chicken, meat will absorb flavors. (You could skip this part just boiling your breast with an onion, carrot and celery if you like, or simply go to the baking step). Keep the chicken broth warm on the stove, ready to go. While chicken is marinating, in a medium bowl combine the cream cheese, green onion thinly chopped and cilantro thinly chopped, mix well adjust salt and pepper. In medium to large skillet, over medium high heat, combine olive oil, when hot add the pepper onion mix, saute’ for 5 to 7 minutes till mixture is soft, add diced tomatoes, taco seasoning, cook some more , add butter, paprika, salt and pepper, cover and reserve. Spray an oven baking dish with oil spray, place the chicken breasts, pour over half of the marinade, bake them 30 to 35 minutes, till juices runs clear, adding the remaining marinade after 15 minutes. When done, remove and let it cool. Set aside. When cool, shred the chicken in small pieces, add it to the bell peppers mixture, over low medium heat, stir well, add the red pepper flakes, stir, add 1/2 cup of broth. Cook 8 minutes more until all flavors come together and combine, so that the chicken, bell pepper mixture is still slightly moist, but not liquid, just very tender to the fork. While the chicken is simmering with bell peppers, lay tortillas, working one by one, spread on each one all over the cheese green onion cilantro mix, in a thin layer. On one side of tortilla add the chicken, bell pepper mixture, top with Mexican/Monterrey cheese and close the tortilla on the edges. Heat over medium high heat a large skillet greased, working one by one, heat up the tortilla, being attentive not to burning it, careful it goes fast (reduce heat slightly if necessary), before flipping sprinkle lightly with the cheese : that will create a crunchy salty top. Flip tortilla now, quickly cook it, remove and repeat with others . It should not take more than 3 minutes per tortilla,if you skillet is at the good temperature. Cut in wedges, serve with sour cream, pico the gallo, or avocado slices and your preferred hot sauce. Have a lot of fun, time to party!!! If you have any leftovers, it freezes wonderfully, and it’s easy to heat in the oven. Those toasted buttery quesadillas sure do look tasty-yum! This does fall into my list of favorites when it comes to Tex Mex, so I am glad to come across this version. Thanks for sharing. By the way, your left column is overlapping your post and I am reading this in foodbuzz, thought you might want to know. Happy you liked the post..
Great post Delizia and a wonderful flavor combination. I wonder how this would work with tofu, pretty good I bet. There is no overlap on my screen, it is all showing correctly. Have a great weekend! 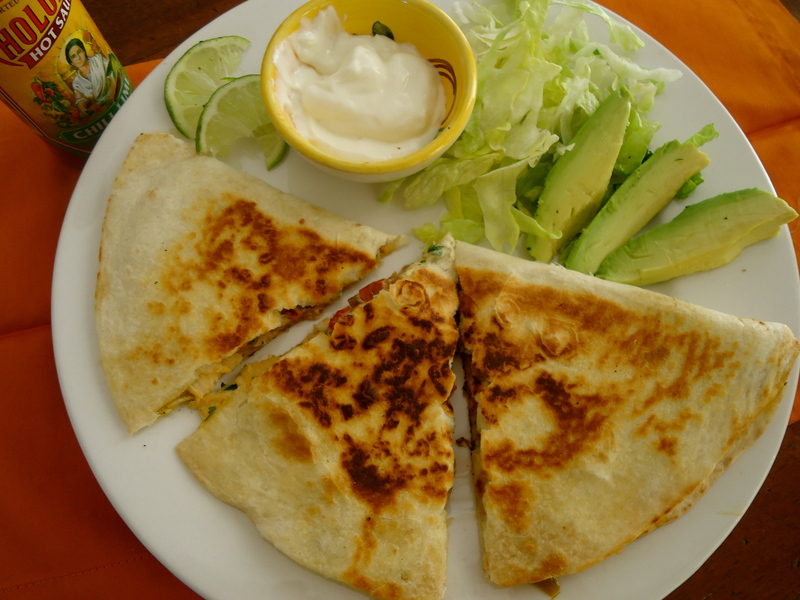 Jon and I enjoyed these tasty and hearty quesadillas for dinner the other night. Thanks Claire for another easy recipe that tastes fabulous.